Be the first to share your favorite memory, photo or story of Claudene. This memorial page is dedicated for family, friends and future generations to celebrate the life of their loved one. 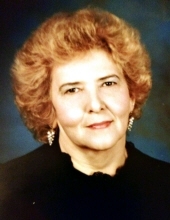 Claudene Helen McCully, age 81, of Aurora, Missouri, passed away at 3:11 a.m. on Sunday, February 3, 2019, in her home. She was born October 5, 1937, in Aurora, the daughter of Charles Floyd and Ella Emma (Farmer) Willard. Claudene was a 1955 graduate of Marionville High School in Marionville, Missouri. She worked as a receptionist for Dr. McCallum in Aurora and was an in home aide with Oxford and Integrity Home Health. She was an avid bowler and bowled in the Women’s League in Aurora, was a member of the Twirl About Square Dancing Club and of the Church of Christ in Mt. Vernon, Missouri. In February 1956, she married Frank McCully in Granby, Missouri. He preceded her in death on March 13, 2012. Claudene is survived by her two sons, Franklin David McCully and Mark McCully and his wife, Tina, of Aurora; four grandchildren, Michele Bustos and husband, Logan, of Hollister, Missouri, Michael McCully and his wife, Sara, of Republic, Missouri, Jason McCully and his wife, Victoria, of Clever, Missouri and Jake McCully and his wife, Cara, of Springfield, Missouri; one sister, Frances Newton of Gardner, Kansas; one brother-in-law, William Hunt of Lincoln, Nebraska and several nieces, nephews and cousins. Her parents, Charles and Ella, husband, Frank, three brothers, Walter, Charles and Robert Willard and four sisters, Lucille Morrow, Evelyn Hunt, Ellen Lyon and Arlene Gardner, preceded her in death. A funeral service will be held at 2:00 p.m. on Friday, February 8, 2019, at the Crafton-Cantrell Funeral Home in Aurora with burial to follow at the Mt. Olive Cemetery. Visitation will be held from 6:00-8:00 p.m. on Thursday, February 7, 2019, in the funeral home chapel. To send flowers or a remembrance gift to the family of Claudene McCully, please visit our Tribute Store. "Email Address" would like to share the life celebration of Claudene McCully. Click on the "link" to go to share a favorite memory or leave a condolence message for the family.